Herbert Woods’ is a name synonymous with both the Norfolk Broads and Potter Heigham. The Herbert Woods boatyard began in 1929, when as a young man Herbert took over the family boat building firm Walter Woods & Sons. He then began an ambitious plan of expanding the small fleet of Broads hire cruisers and creating the boat building and mooring facilities of ‘Broads Haven’ that make up the marina that you see today. Herbert Woods went from strength to strength quickly becoming one of the best loved boatyards on the Broads. Following Herbert’s death in 1954 the company was bought by private investors and since then has changed hands a number of times, operating under various names including Pennant Holidays, Funnel Group and Norfolk Broads Direct. Herbert Woods was purchased by its current owners in 2010 and the decision was made to restore the original Herbert Woods brand name on all of the boats. We are proud of the legacy left to us by this pioneering man and continue to expand our fleet of cruisers and picnic boats in true Herbert Woods spirit. The word ‘Light’ features in all our boat names following in the tradition of the first fleet of Herbert Woods ‘Light cruisers’. Since 2010 the Herbert Woods – Broads Holiday Adventures brand has gone from strength to strength and has helped to establish Herbert Woods as the market leader in Norfolk Broads Boating Holidays. In 2015 we were awarded the EDP Visit Norfolk Tourism Award for ‘Best Broads Holiday Experience’ and became the first Broads Boatyard to achieve British Marine & Visit England Quality Accredited Boatyard status. Herbert Woods continues to receive the TripAdvisor’s ‘Certificate of Excellence’ year on year for our high levels of customer service. Today we are delighted to say thousands of people have a ‘Herbert Woods Holiday’ each year, but who was the person behind today’s successful company? Well he was a man totally dedicated to the Norfolk Broads and who wanted to give people the opportunity to enjoy this great inland waterway to the full. Herbert was born into a family of boat builders and on leaving school in 1907 became an apprentice with the Norfolk Broads Yachting Company then managed by his father Walter. Turned down for active service in the First World War because of a neck problem that would trouble him all his life he joined Ransomes Sims & Jefferies in Ipswich. Here he helped to build aircraft and this is where he first learned about aerodynamics which would come in very useful several years later when he was designing boats. Herbert Woods continued working in Ipswich after the war and was credited with designing and building the company’s first electric vehicle. By now his father had bought the premises of the Norfolk Broads Yachting Company which had gone into liquidation. 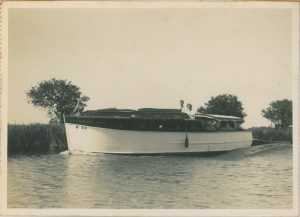 With Walter suffering from ill health he asked Herbert and his brother to come to Potter Heigham to help in the business and in 1922 ‘Bootlegger’ a yacht was launched which Herbert had helped to build. Shortly afterwards Herbert Woods set about designing and building a boat that would change the face of Norfolk Broads cruisers for ever! The ‘Speed of Light’ completely revolutionised the design and layout of Broad’s cruisers. Up until then they had tended to be unmaneuverable, with noisy engines that were difficult to start and created a lot of wash.
‘Speed of Light’ was 34ft in length, yet drew only 2ft of water, and was the first Broads motor cruiser to have the wheel and controls amidships. She also had a quiet Morris engine and a fresh water tank to feed the taps and toilet. To this day all Herbert Woods cruisers still proudly bear the name ‘Light’. 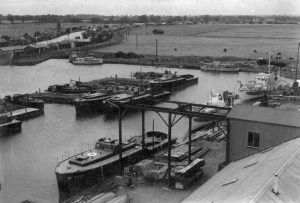 Over the coming decades Herbert Woods set about building up the business from its base in Potter Heigham which included constructing the six acre ‘Broads Haven’ which is still with us today. It is hard to believe this project involved 60,000 tons of heavy clay soil being removed by hand! By the mid-1930s it was finished, complete with its own shop selling everything you might need for a boating holiday, and there was even a hairdressers. Around this time Herbert Woods built a new tower to house a water tank, but designed it to have a reception area, offices and storage space. That tower still dominates the skyline at Potter Heigham and guests can once more stay in three apartments recently restored to a very high standard. 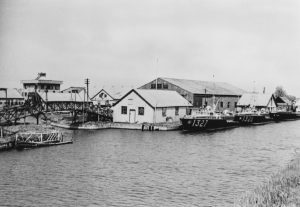 Herbert Woods and his workforce played a vital role during World War Two building a wide variety of craft including Motor Torpedo Boats and Harbour Defence Motor Launches. The famous tower became a look out post complete with machine guns! By the time peace was restored Hebert Woods’ fleet of hire craft was in a very poor state after years of neglect. He gave himself a goal to have a new fleet of 50 cruisers up and running as soon as possible. 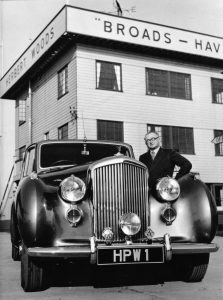 Herbert Woods died in April 1954 by which time the hire fleet had grown to 139 boats and the company was once again prospering. 1891 – Herbert Woods is born 3rd February. 1907 – Young Herbert begins his apprenticeship at Broads Yachting Co Ltd at Potter Heigham. 1922/23 – Herbert and his family move to Potter Heigham to work at the family business Walter Woods & Sons. 1926 – Herbert builds the first of the ‘Light’ cruisers ‘Speed of Light’. 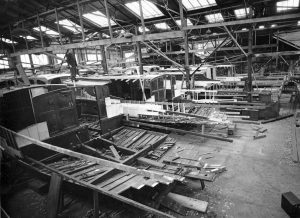 1929 – Herbert buys the family business and Herbert Woods Boatyard is formed. 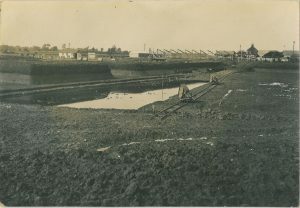 1930 – Work begins on digging out the yacht basin and creating mooring facilities at ‘Broads Haven’. Herbert Woods has always been a name associated with quality boat building on the Norfolk Broads. 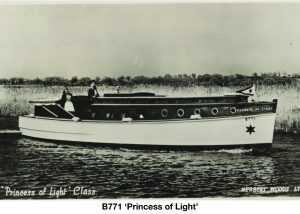 It was in fact Herbert Woods himself who came up with the design for the original ‘Light Cruiser’ the likes of which you can see operating out of many of the boat hire companies on the Broads today. 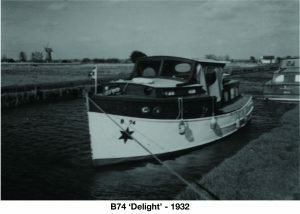 Prior to 1926 cruisers and yachts were available to hire on the broads, however the cruisers with their shape to suit the narrow rivers and shallow broads, had been unpopular. They were usually converted working boat hulls that were poorly equipped and difficult to manoeuvre. The engines were smelly and noisy and usually difficult to start, and the majority of the boats created an undesirable wash in their passing, which posed problems for other river uses as well as the delicate eco systems of the Broads. Herbert noted these short comings and endeavoured to design and build boats to overcome the failings of existing hire fleets. He commenced his design from scratch considering ease of handling, reliability, good visual appeal and customer comfort in his criteria and produced a new class of boat, the ‘Light Cruiser’. The ‘Light Cruiser’ was easy to handle in the narrow waters of the Broads, dramatically reduced the amount of wash and wake created by the boat and incorporated a quiet, almost vibrationless, clean and easy to maintain Morris Marine engine. The interior was luxurious and homely and included many of the features you will still find on our boats today, including a well equipped galley with fresh water tanks to feed the taps and WC, side seats that were able to convert to night-time bunks and a sliding sunshine roof to maximise the amount of light. Understandably the ‘Light’ boats were an immediate success and were rapidly followed by other “Lights”. Other boatyards were quick to get on the bandwagon, although none of these managed to achieve the ‘Broads Haven’ manoeuvrability, smoothness of passage, fine appearance and well turned out comfortable interiors. Herbert Woods continued to design and build light cruisers up until his death in 1954. Today we are proud of the legacy left to us by this pioneering man and continue to expand our fleet of cruisers in the true Herbert Woods’ spirit. The fleet now comprises over 130 cruisers and you will notice that the name ‘Light’ features in all our cruiser names following in the tradition of the first ‘Light Boats’.